Teachers are always looking for real-world examples of Science, Technology, Engineering and Mathematics. We’ve prepared a STEM tutorial that demonstrates they are all really used in the real world. The tutorial is aimed primarily at high school students and college bound students. Topics range from simple logic problems to using calculus to model complicated systems. Includes several Computer Based STEM programs to demonstrate these real-world STEM simulation examples using Microsoft Windows. Chapter 1 covers some key points in solving problems – stressing solution of real, not textbook, problems. Chapter 2 reviews the math behind thermostats and furnace operation. Examples illustrate computing temperature changes within a home. This chapter provides an application in one particular area, that of home heating. We discuss the mathematics behind a thermostat and provide equations that allow computation of temperature changes within a home. Sample problems are given, as well as suggestions for further study. Chapter 3 reviews the dynamics behind satellite motion illustrating typical orbits, orbit transfers and rendezvous problems. Satellites in orbit around the earth are commonplace. They are used to transmit television signals, telephone calls, weather data, airplane navigational information, and radio programs. And, many of today’s cars are equipped with GPS (global positioning satellite) locators that help them get around in traffic! Manned satellites, such as the Space Shuttle, allow for all types of valuable experimentation and space repair work. In this chapter, we look at some of the mathematics and physics behind satellite orbits. We first answer the question of why satellites orbit by discussing the dynamics of satellites. 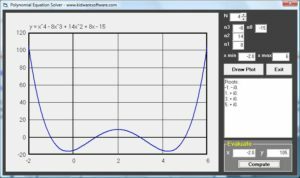 Then, we examine typical orbit problems, such as how to establish an orbit and how to move from one orbit to another. Many example problems and suggestions for further work are provided. Chapter 4 reviews how complex numbers are used in a real problem – pendulum motion. Need familiarity with quadratic equations. In the study of quadratic equations, students are introduced to the concepts of imaginary and complex numbers. A common question is: why do we have to worry about imaginary numbers? After all, if they’re imaginary, they don’t exist! This chapter gives a real-world example of the use of complex numbers and shows how they relate to real quantities. We show how a quadratic equation (and complex numbers) can be used to model the dynamics of a swinging pendulum. Equations for both a normal and an upside-down (inverted) pendulum are developed. We also discuss how we can use mathematics to balance an inverted pendulum (the same concept used in every rocket and missile launch in history). The equations presented can provide a springboard for classroom simulation studies. 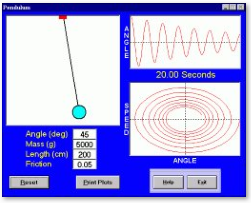 Computer Pendulum Simulation software included. The example problem in Chapter 5 involves the trajectory of a projectile. The problem is to reach a desired point by selecting a launch angle. 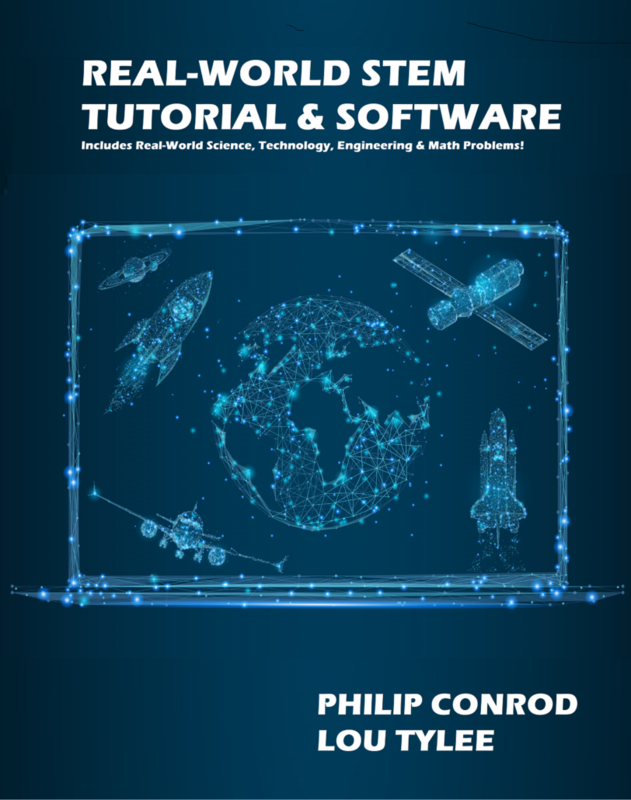 This problem has a wide variety of real applications: rocket and missile launching, targeting and intercepts, satellite orbit transfers and rendezvous, numerical optimization, polynomial root finding, and solving nonlinear equations. The mathematics needed to solve the problem are not too involved – only algebra and trigonometry. The process of solving the problem, however, is at times detailed and tedious. But, this is a concept that needs to be taught: real-world problems are not necessarily easy. Before looking at the solution, we will examine the real-world problem solving process. In this chapter, a closed-form expression (an exact equation) to the trajectory problem (required angle to reach a point) is found. Closed-form solutions are rarely possible in the real-world. We usually resort to solving our problems numerically, using a computer. Requires algebra and trigonometry. 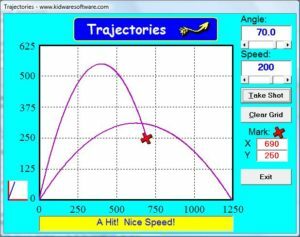 Trajectory Simulation software is included. Chapter 6 reviews a numerical approach to the problem studied in Chapter 5. In this chapter, we look again at the projectile problem, but the solution emphasis is on iterative, numerical solutions. Both one-dimensional and two-dimensional solution methods are discussed, as are some of the checks that must be made and the pitfalls that should be avoided when using such methods. 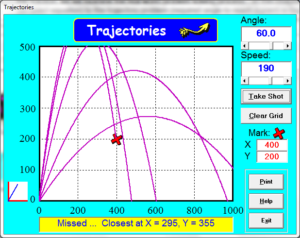 For classroom purposes, examples of potential applications of the trajectory equations are discussed. Requires pre-calculus and trigonometry. Chapter 7 is a discussion of numerical methods for solving “unsolvable” problems. 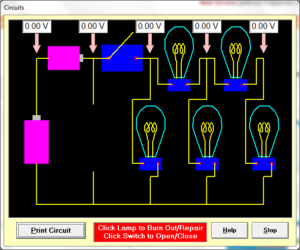 Illustrated with rocket engine example and coordinate conversions. Rocketry software included. In this chapter, we look at solving two problems numerically. The problems solved are relatively simple and actually have closed-form solutions. We use simple examples to illustrate the steps involved in obtaining numerical solutions without getting too involved in the mathematics. And, by having closed-form, or exact, solutions available, it gives us something to check our computer programming techniques. The first problem (one-dimensional) requires the determination of a model rocket engine’s burn time in order to achieve a desired altitude. The second problem (two-dimensional) is a numerical implementation of converting from rectangular to polar coordinates. While solving these problems, we will address some of common problems encountered when implementing numerical (computer-based) solutions. 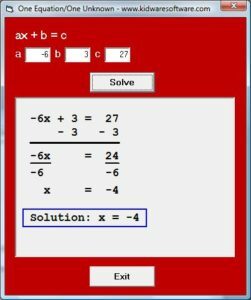 Suggestions for using the example problems and potential expansions of the problems are addressed. Chapter 8 is a study of the mathematics behind the modes of robot arm operation. Robotic arms are commonplace in today’s world. They are used to weld automobile bodies, employed to locate merchandise in computerized warehouses, and used by the Space Shuttle to retrieve satellites from orbit. They are reliable and accurate. 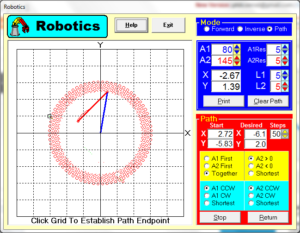 This reliability and accuracy is due to the computer a robot arm uses in determining where and how it should move. This control computer is programmed with some basic mathematics. In this chapter, we will look at the mathematics behind robot arms. We will study trajectory planning. We look at three basic problems: kinematics, inverse kinematics and trajectory planning (getting from one point to another). We examine each of these problems separately, using the two-link robot arm. 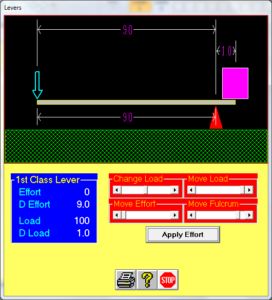 The Robotic ARM software program demonstrates the concepts presented here. Requires algebra and trigonometry skills. Chapter 9 is an illustration of the beauty of math – how solving for the roots of a polynomial can generate beautiful fractal graphics. Solving a linear algebraic equation is a simple process and to find the roots of a second-order polynomial, we use the quadratic equation. There are also specific procedures for finding the roots of a third-order polynomial. However, for fourth-order and higher, we need other ways to find roots. In this chapter, we study the Newton-Raphson method for finding roots. To use the Newton-Raphson method to find polynomial roots, we need an initial guess at a root. Every point in the complex plane is a potential solution, hence a potential guess. If we use each point in the complex plane as an initial guess, compute the resulting converged root, and track which guess converged to which root, we obtain a mapping of initial guesses to final roots. This mapping, when drawn in color on a computer screen, can provide pretty and surprising results. Such mappings are fractals. We develop a procedure for generating fractals from the solution of a general polynomial. For each step in the procedure, the pertinent equations are provided to help you understand the technique and develop your own computer routine (with modifications, if desired). Requires some algebra. 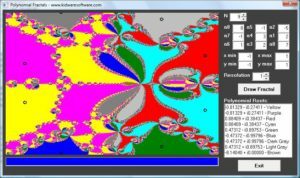 Fractals Simulation software included. Chapter 10 demonstrates how something as simple as a water wheel can exhibit chaotic, strange behavior. In this chapter, we model a four bucket version of the Lorenz water wheel – a famous system that exhibits a chaotic nature. 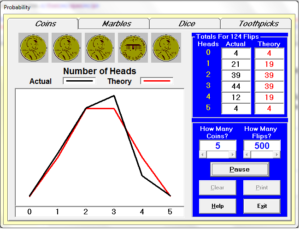 Equations modeling the rotational dynamics, frictional effects, and bucket flow characteristics are developed. Then, implementation considerations for solving the equations are presented and some typical results presented. 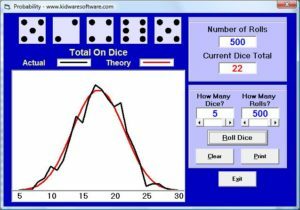 This is an advanced application of mathematics and physics. You should be familiar with differential equations and physical system dynamics to understand the material. 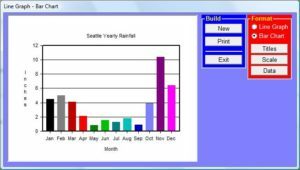 The Water Wheel simulation program demonstrates the concepts presented here. 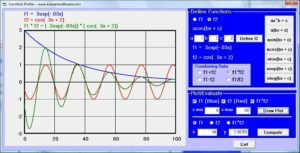 This chapters has detailed dynamics equations to build a simulation. 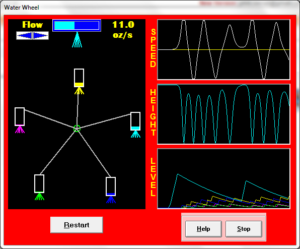 Water Wheel software included. Chapter 11 demonstrates how a pilot knows how fast an airplane needs to be going prior to takeoff. 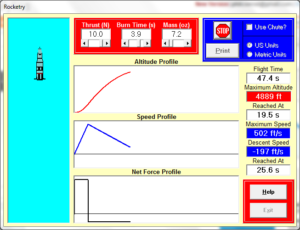 This chapter describes the process performed by an onboard airplane computer in determining speeds the pilot uses in making decisions during takeoff. The mathematics involved requires knowledge of second-order polynomials. As a pilot accelerates from a stop, he/she must be cognizant of a quantity referred to as the decision speed. This is the speed at which the pilot must choose to either continue with the takeoff or abort the takeoff and stop the airplane. The value of this speed depends on many things: altitude, temperature, airplane configuration, weight, braking energy, and engine type, to name a few. But, for demonstration purposes, we can compute this speed using some simple physics and math. The speed can be determined in two ways: a direct solution and a numerical solution. 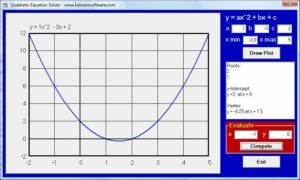 Polynomial Equation software included. Chapter 12 demonstrates how derivatives can be applied to real-world problems. This chapter presents two applications of derivatives (a beginning calculus topic) related to computing the distance required to stop an airplane. This is an important problem because this distance must be within the constraints of the runways where a plane might land. First, we look at using curve-fitting techniques to develop an equation for brake force that insures a smooth transition from zero braking to full braking force. Second, we develop equations for the deceleration and speed of an airplane and show how we can numerically solve these equations (simple differential equations) to obtain an approximate value for stopping distance. Example data and results are presented for several different airplane models. We discuss curve fitting and braking requirements for a jetliner. Requires basic calculus skills. “We use all KIDware programs here at our school and are well pleased with them. ” – JC, Sioux City, Iowa. “We use all your programs at our school and love them! ” – CS, Sioux City, Iowa. “My wife and I are elementary school teachers. We think this software is great! ” – UC, Fort Worth, Texas. “I love SCIENCE FAIR because I have so much fun with it! ” – BK, Szekesfeherwar, Hungary. “SCIENCE FAIR is great! We appreciate finding learning software that doesn’t fill up our hard drives.” – JJ, Vancouver, Washington. “I’ve looked at lots of software and yours is the best. You have a great company!” – RP, Columbus, Georgia. “I love this software and will be recommending it to my friends! ” – CF, Milford, Delaware. “My family loves all your software. This software is a great contribution to world education. ” – CY, Tokyo, Japan. “We have recommended your software to several people. We love it here at [our school]! ” – – TS, Walhalla, South Carolina. “I am a teacher and a grandfather. I find all your programs excellent. Keep up the great work.” – PK, Toronto, Ontario, Canada. 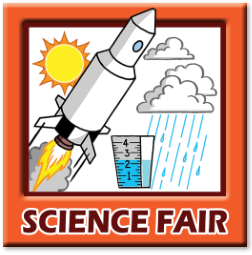 “I’m a science teacher and your SCIENCE FAIR programs are outstanding.” – GF, Renton, Washington.